I have a secret, I wear headphones. I have a secret. Last night when my head was hurting from the day’s chatter and I was sure I had lactic acid build-up of the ears ( see July 20th post), I put on my headphones. Sometimes, usually late at night when the moon is high in the sky and the house is quiet, I might have my headphones on. I am occasionally watching a show on Netflix or Hulu just taking a little “me time” before I get in touch with the back of my eyelids. There are nights a teenager or adult child peeks their head in my bedroom and I just close my eyes. They probably think , ” Poor Mom fell asleep watching something.” Or I point to my headphones and then David sleeping and smile and wave. We had two sets of headphones and one set quit working. My entire family looked at me as if I were near- crazed as I broke into a cold sweat and frantically looked all over the house for the other pair. 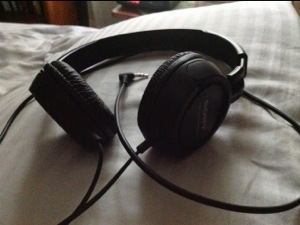 They are unaware of the relationship the headphones and I have- our little secret. I am not sure what my sweet husband thought I was listening to right before dinner with my headphones on, but I like the way he thinks. As he came in from outside and leaned in, gave me a kiss and asked, ” So what are you listening to or watching?” I smiled a Garfield-the -cat -size-smile and held out the end of my unplugged headphone and pointed to the IPad three feet away on the windowsill. I’m not sure if I can pull it off again, but if you run into me at the grocery store or around town with my headphones on, just smile and wave please, it’ll be our little secret. That’s right, go ahead and picture me with these headphones on in the middle of Whole Foods. The cashiers will just think I am taking my singing to a whole new level. This entry was posted in Life and tagged Headphones, Hulu, Netflix. Bookmark the permalink.